It may never make it into everyday jet-fighter use but NASA is checking out biofuel made from chicken and beef fat. The chicken fat fuel, known as Hydrotreated Renewable Jet Fuel, was burned in the engine of a DC-8 at NASA's Dryden Flight Research Center as part of its Alternative Aviation Fuels Experiment that is looking at developing all manner of biofuel alternatives to traditional Jet Propellant 8, or JP-8. The DC-8 is used as a test vehicle because its engine operations are well-documented and well-understood, NASA says. The researchers measured the fuel's performance in the engines and examined the engine exhaust for chemicals and contamination that could contribute to air pollution. According to NASA, it was the first test ever to measure biofuel emissions for nitrogen oxides (NOx) and tiny particles of soot or unburned hydrocarbon - both of which can degrade air quality in communities with airports. NOx contributes to smog and particulate matter contributes to respiratory and cardiovascular ailments. NASA said that in the engine that burned the biofuel, black carbon emissions were 90% less at idle and almost 60% less at takeoff thrust. The biofuel also produced much lower sulfate, organic aerosol, and hazardous emissions than the standard jet fuel. Researchers will spend the next several months comparing the results and drawing conclusions, NASA said. The Air Force too has been experimenting hydrotreated fuel. It has successfully flown a couple jets in its arsenal on 50-50 blends of Hydrotreated Renewable Jet fuel, or HRJ, and JP-8. 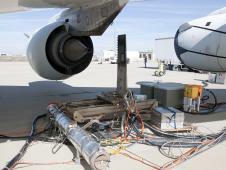 In the past the Air Force has stated it wants to fuel half its North American fleet with a synthetic-fuel blend by 2016. The Air Force is the single largest user of aviation fuel inside the Federal government, using an estimated 3 billion gallons per year, according to the Air Force. Each time the price of oil goes up $10 per barrel, it costs the Air Force an additional $600 million for fuel.